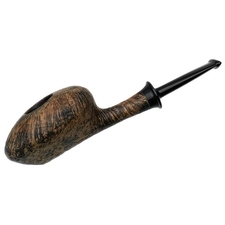 Gian Maria Gamboni is an Italian pipe maker who was born in Florence in 1970, though now lives in Rome. Given his immersion in Renaissance art in his youth and memories of his father (a sculptor and pipe smoker whose studio was often visited by other artist/pipe smokers) while in England, it's no surprise Gamboni wanted to make his own mark in the world of finer things. He picked up pipe smoking in the 1990s and has loved it since. 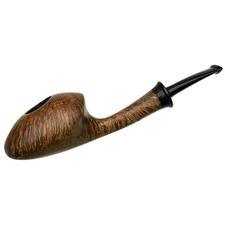 After visiting Becker & Musico, he made his first pipe (Becker's influence in shaping can clearly be seen in his work). In 2011 Gamboni began to "grade" his pipes using golfing terminology, which he further revised in 2013. For smooth pipes, the stamps are "Skins Game" and "Stableford". 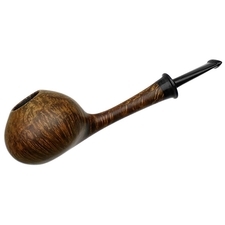 Sandblasted pipes are stamped "Fairway" or "Putting Green", while "Teeing Ground" is reserved for rusticated pipes. For his best pieces, he stamps "Hole In One", which is, perhaps, a good way to express excitement and rarity of the piece. Each of his stems are hand-cut from vulcanite rod with turned, incorporated tenons.